Tournament of the Stars II took place at Ohio State University on September 20, kicking off the season in the Midwest region. In our tournament preview, we mentioned a handful of storylines that made this tournament an intriguing one. A few more storylines have emerged, slamming the front pages, while other have fallen to the wayside. Before jumping into the new storylines, let us revisit the ones addressed by Luke Changet in the aforementioned article. Can Ohio State live up to the hype? As will be made apparent throughout this article, some of these storylines are easy, straight-forward answers, while others take a little more time to sift through. This one, however, is one of the easy ones. The answer is yes, Ohio State absolutely can. They look to be to the Midwest what the Lost Boys were to the West last season. 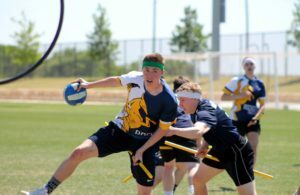 Without Ball State University slowing the pace of the game way down in their semi-final match (in pool play, the two teams met with a 120*-30 Ohio State victory), Ohio State would have entered the championship game having not played a single game within snitch range in dominating fashion. Expect the Buckeyes to come out angrier than ever in their next tournament and have a strategy developed to combat a slow tempo game. This team is the best in the region and can beat any team out of snitch range consistently, expect maybe Bowling Green and the yet-to-be-seen University of Michigan. What is left of Bowling Green State University? It was a shame that we watched Bowling Green play their pool repeatedly until a slow-paced final that did not show any inkling of how this team played throughout the day. The returning players did exactly what everyone has come to expect them to do and the new players fit in nicely. Expect this roster to be out of snitch range for the majority of games, sans finals match ups with other top-tier teams in the Midwest. Will Central Michigan fill the gaping holes at beater? No, not yet. 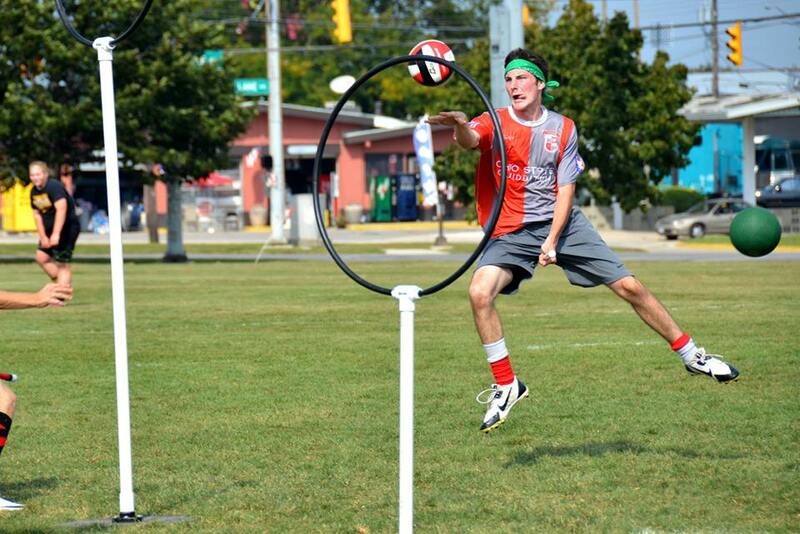 Losing to a severely beater-depleted Blue Mountain Quidditch Club does not look good for this team. Talking to Changet, who played beater for Blue Mountain, he said that the Central Michigan beaters showed just how new they are. Looking forward, veteran Centaur beater Rebecca Bennett has a lot on her shoulders and just how much she can handle is yet to be seen. 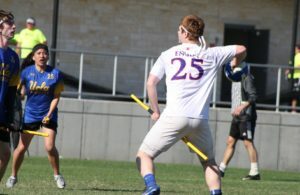 From the looks of it, this team did load their male beating core with big and physical players, but how quickly they can learn the game will be a huge indicator of how they will fare at the Midwest Regional Championship. How will Blue Mountain fare in their first tournament? Blue Mountain was extremely unpredictable coming into Tournament of the Stars II, and it is safe to say that nothing has changed. Losing to Bowling Green narrowly out of snitch range (after being down 80-10 at one point in the game), losing to Miami University of Ohio by a snitch catch and beating Central Michigan by a snitch catch is a true demonstration of mixed results. My takeaway is that this team is going to play similar to Ohio State did the last time Changet put on a Buckeye uniform. Scores will be low, they will hold onto bludgers tightly and hope that seeker Jack Norgren can win them some games. Add in all of the missing beaters and there will be even more in-snitch range games for this team to try and pull out. With the late loss of Tyler Walker, can Trevor Campbell become more than just the emotional leader for Ball State? The mid-tournament adjustment from Campbell led the team to a tournament championship. After being dismantled by Ohio State in pool play, Campbell made the only adjustment possible in order to upset Ohio State and Bowling Green. Talent seemed less abundant than it has in the past but with this ability to make crucial adjustments midway through tournaments, Ball State could make a run at the Midwest title. At the end of the day, there is still a lot to be desired about this team. Where they go from here will be the true indicator of Campbell’s impact. Can a new team join the crowded top of the Midwest? In the pre-tournament article, Changet mention Grand Valley State University and Miami as potential teams to crash the upper-echelon of Midwest teams. We can easily dismiss anything from Grand Valley after their very sub-par performances against opponents. Even Wooster College held them closer than they would have like. This lackluster performance from Grand Valley ultimately led to them to a ninth place finish out of 12 teams, just ahead of two Junior Varsity squads and the aforementioned Wooster. The team did not see bracket play. That brings us to Miami. After consistently playing close matches against Bowling Green last year, Miami had to feel good and confident coming into their pool. But then they started the day by getting dismantled by their aforementioned rival. Following that loss, they won two in a row, including their match against Blue Mountain. They managed to get second in their pool and secured the sixth seed going into bracket play. Unfortunately for them, they drew Bowling Green once again, leading to a closer, but still decisive, victory for the Falcons. Miami, as of now, will stay on that bubble until further evidence proves that the victory over Blue Mountain is more than just a win against a fellow bubble team. Now onto the storylines that have surfaced since Ball State claimed Tournament of the Stars II. Tournament of the Stars II saw new rosters enter the playing field, but it also saw the premiere of USQ Gamplay Department’s improved Player Disciplinary Policy. As reported by The Eighth Man via Twitter, Gabe Unick of Grand Valley is alleged to have committed multiple instances of foul play and one instance of sexual harassment during the team’s match against another Midwest team. Said team has since filed a complaint with USQ. Grand Valley suspended Unick following the tournament. The team announced via Tumblr that their primary reasoning for the move is “his physical play, [which resulted in] giving one of [that team’s] players a severe concussion and AC damage, placing her in the hospital.” The USQ Gameplay Department is expected to make a ruling on the situation sometime in the coming weeks. 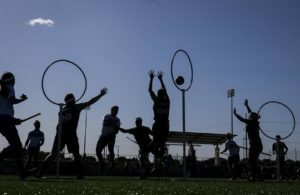 University of Kansas nearly knocked off Texas A&M at World Cup VII by essentially halting the game, limiting the Aggies’ touches and hoping to catch the snitch for the upset. It seems this strategy has now been adopted by other teams in the league. Ball State faced a shellacking at the hands of Ohio State in pool play, which, as mentioned above, led to a major shift in strategy. The team became the first of the season to successfully utilize the possession-offense strategy, defeating both Ohio State and Bowling Green by freezing the game. With the strategy proving effective this early on in the season, it will be an interesting to see exactly how other teams utilize it and combat it. I expect to see much more mid-tier teams to at least attempt it against the top-tier while they, simultaneously, search for ways to put an end to it. A child of the corn, Daniel is a fifth-year player for Bowling Green State University. He has been a captain for the past two years, leading Bowling Green to a Final Four run at World Cup VI and a Sweet 16 finish at World Cup VII. He was also named The Eighth Man Sportsman of the Year in 2012.